My hubby loves lemon pound cake and so I searched on line for recipes. I ran across one using a Duncan Hines Cake Mix that has added ingredients. That wasn't really what I was looking for, but my coworker told me she makes it all the time and that it turns out great. Easy and delicious... I'm always up for that! It did turn out really delicious and I have added it to my list of keeper recipes. 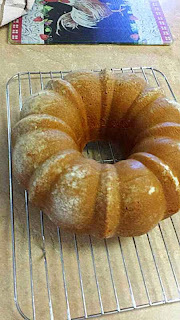 I used my Bundt cake pan. 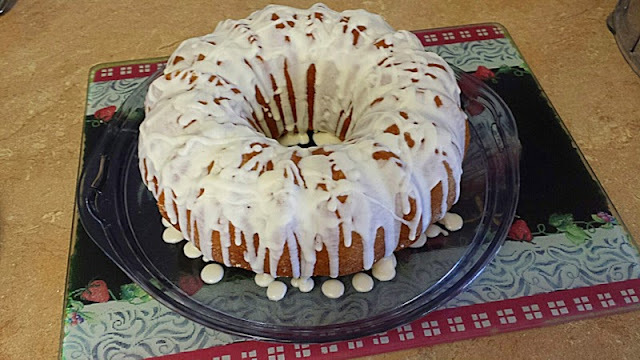 You can find the recipe on the Duncan Hines Signature Lemon Cake Mix box. The frosting is the Duncan Hines Vanilla flavor. But I am going to try the lemon flavor next time. You just heat a small amount in the microwave for just a few seconds and then drizzle it over the cake.